Japan is usually viewed in two different lights; the fast paced city of Tokyo with it’s narrow alleys and thousands of bright signs, and then there’s the images of old world Kyoto where red lamps hang on the ends of small wooden buildings and stores and where traditional geishas walk down the street wearing white makeup and everyone sits on their knees at the tables. So, while the part about Tokyo is obviously true, what about Kyoto? 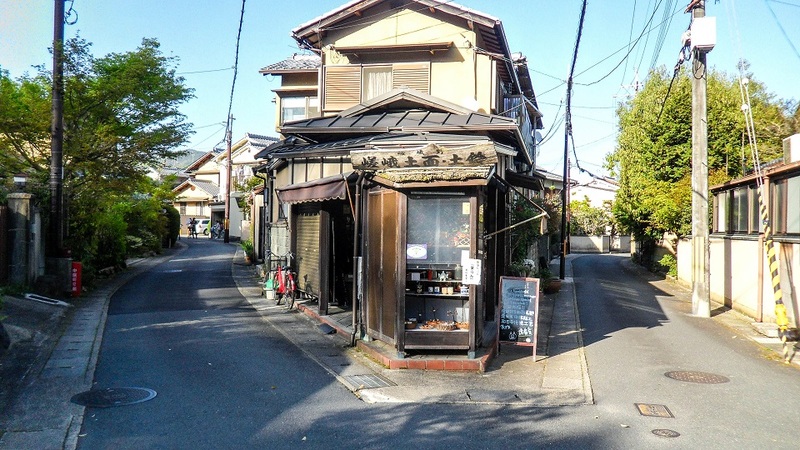 A tiny corner shop in a more suburban area of Kyoto. 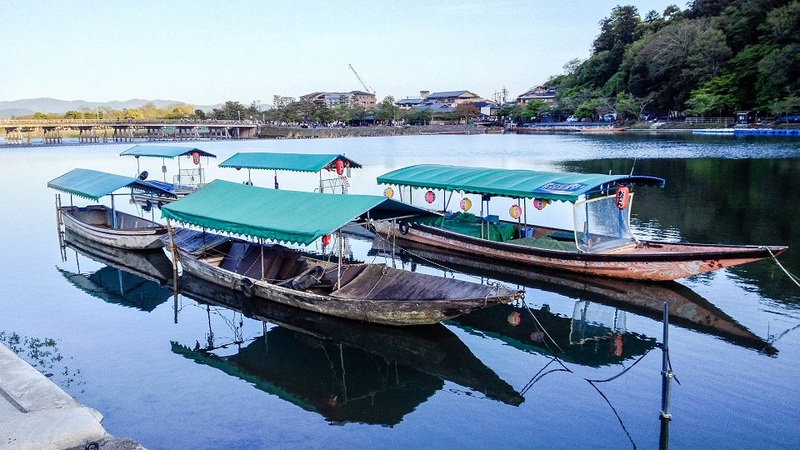 Yes, there is the occasional photo of something amazing that isn’t in Kyoto, like the famous torii gate in Itsukushima often referred to as the “Floating Gate” where it looks like the gate floats in the water. I unfortunately didn’t have time to see this though, I can’t complain as I saw something amazing every single day I was in Japan. 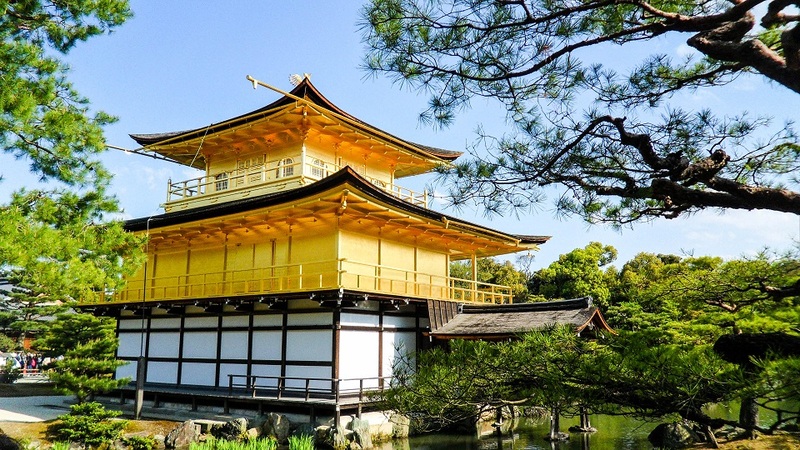 Random Fact: Kyoto is actually the original capital of Japan, not Tokyo! 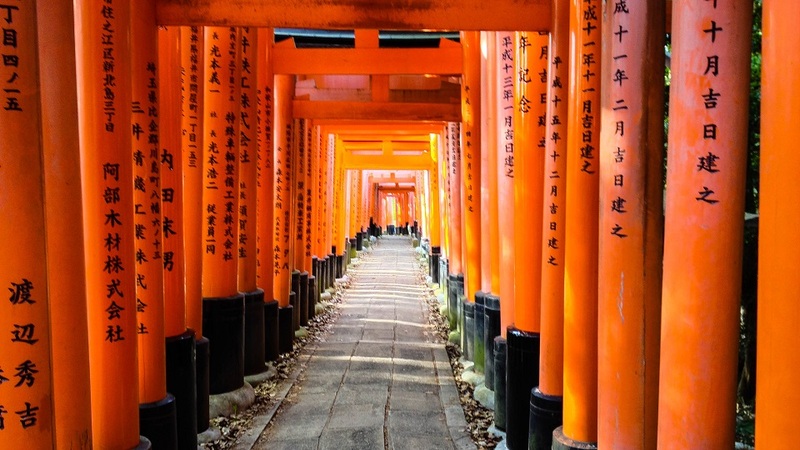 The first thing I did upon arriving in Kyoto was to conquer yet another long time goal, visit the Fushimi Inari-Taisha Shrine; this is where the long orange tarii gate covered paths are located. I’ve always been facinated by the photos I’ve seen and often thought to myself “they can’t really go on and on for very long, can they?”, but as I said before, there are literally thousands of these. The part where they’re very condensed is in a more focused area, this is where most of these pictures are taken that you see; but they still go on much much further than you would expect. 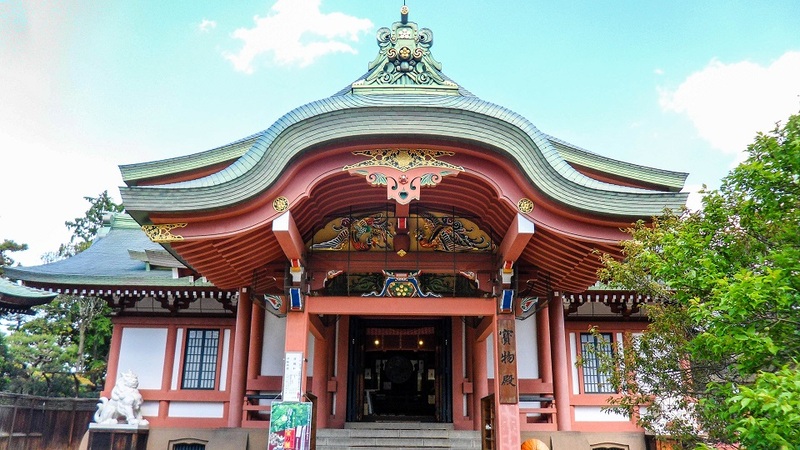 While this is probably the biggest attraction at the Fushimi Inari-Taisha Shrine, there’s also the shrine itself and the mountain that these orange tarii gates scale (yes, you walk through these going all the way up a mountain)! 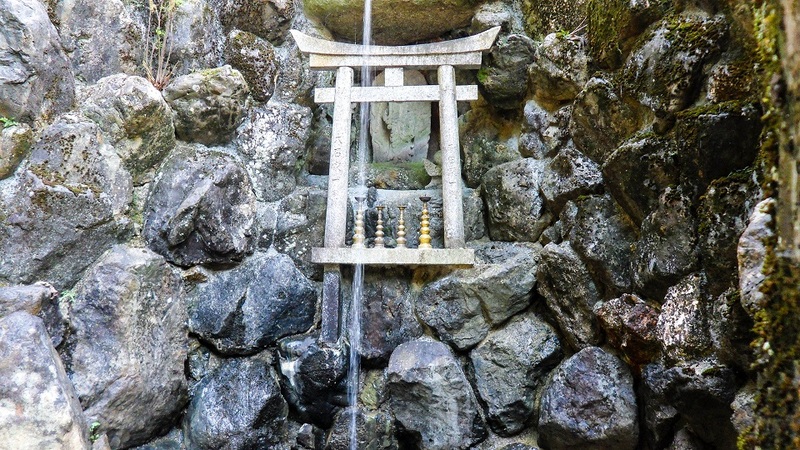 At the very top of the mountain there is a shrine that basically has a maze going around it along with several thousand mini tarii gates scattered all over the place. 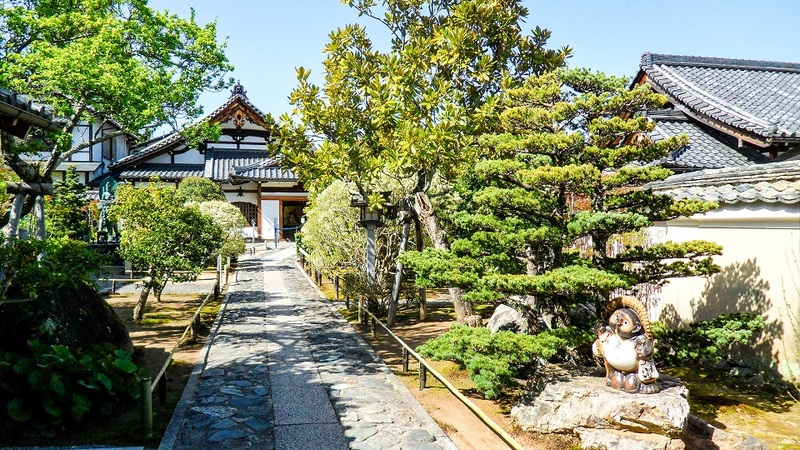 Other than that there actually isn’t too much to see up here, there’s no real view looking out because there’s trees all around, and the shrine itself isn’t anything too special to see surprisingly. So, with that said, I did go find myself a high-up view that I could be satisfied with. The maze going around the shrine at the very top and the countless miniature orange torii gates. While I’m not sure it was worth the trek up just for this shrine, it was pretty cool to see. Though walking through all the big orange torii gates makes it worth it! This was the view I was after! 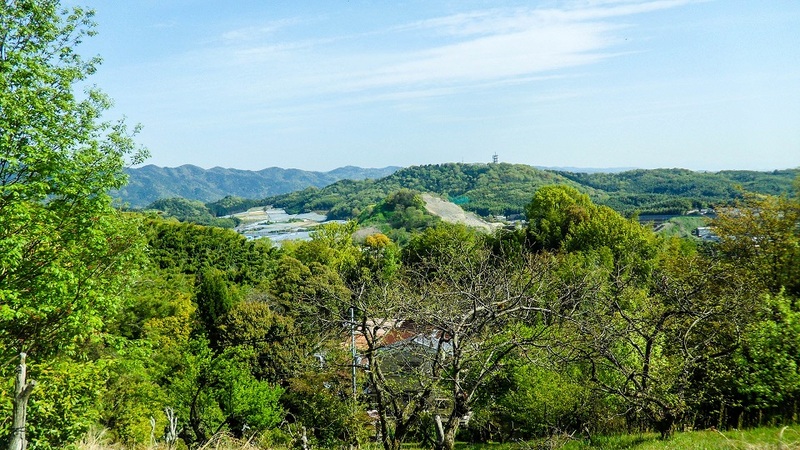 Random Fact: Kyoto is the only major city in Japan that’s inland and is surrounded by mountains. 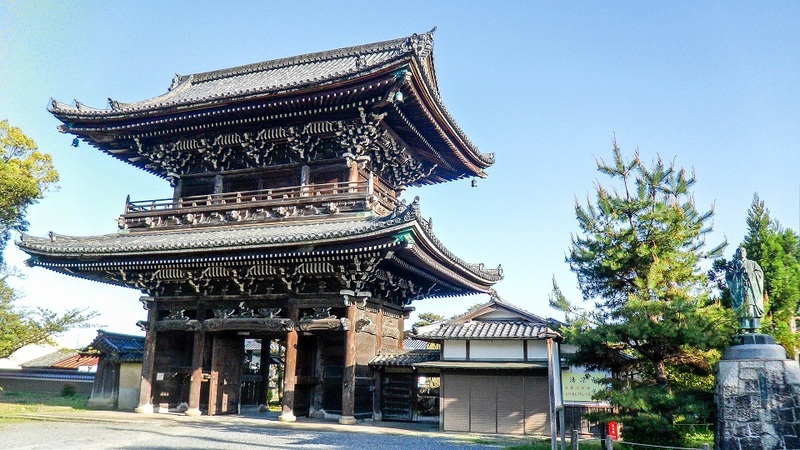 The emperor decided on this to help prevent the city from attacks of evil spirits and invaders. And unfortunately I cannot tell you where this view was at. 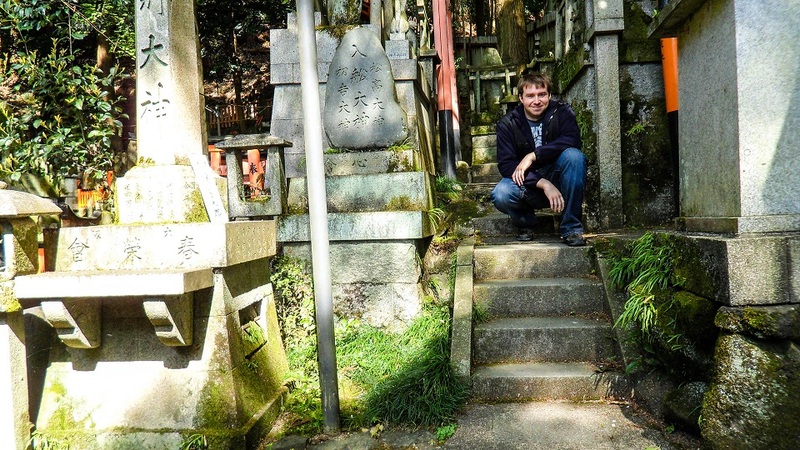 After going through all the torii gates and then wandering through a forest for a good half-hour I walked down a couple random streets before spotting a high up point and walking carefully through an uphill garden and some random property before finally climbing up to this point! I did point it out to a couple british guys when I got back down to the street who were also adventuring around Kyoto and they headed up right afterwards. This was probably the most challanging picture I’ve taken yet, I didn’t fall during my ascent or descent, but I came close a few times, it’s a bit of a steep climb up. The trek through the forest though was very beautiful and quiet, it’s not exactly a paved walkway, there’s a narrow brick path you’ll follow and also find some pretty cool shrines deep in the forests too! My view looking down (to the right of the path) as I ascended up. This was the trail that I walked along. The in-ground bricks are so narrow, it’s much safer to not walk on them at all. One of the several shrine areas I discovered while following the path through the forest and up the mountain (not the torii gate path). I also discovered a couple of these spots as well. So there; we have checked off the shrines deep within bamboo forests, along with a bamboo forest itself, but not THE bamboo forest. The famous one that is considered one of the most photographed forests in the world might still be lingering in your mind. 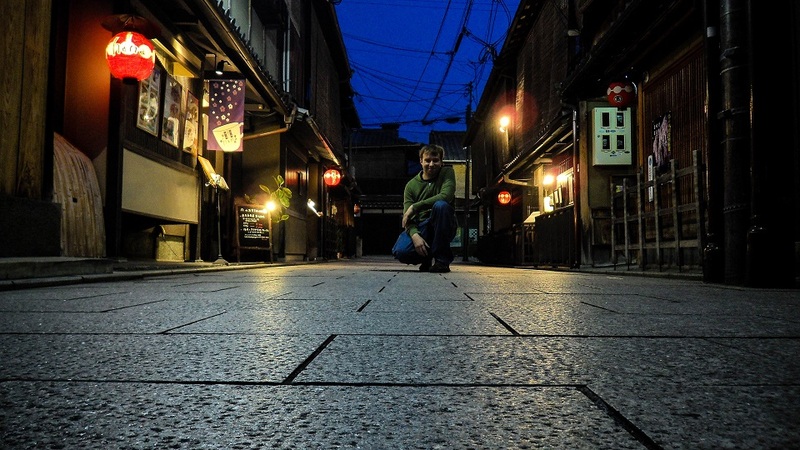 After being satisfied with what I had achieved that day, I headed back to the city of Kyoto to eat and recharge. 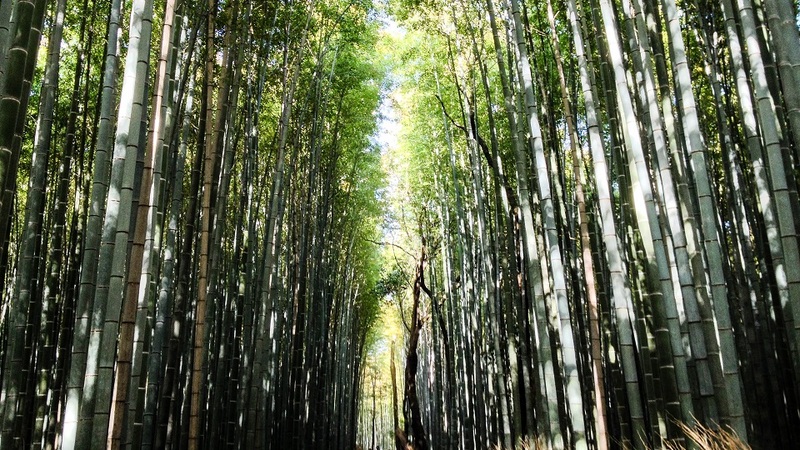 What about the famous bamboo forest picture I keep talking about? 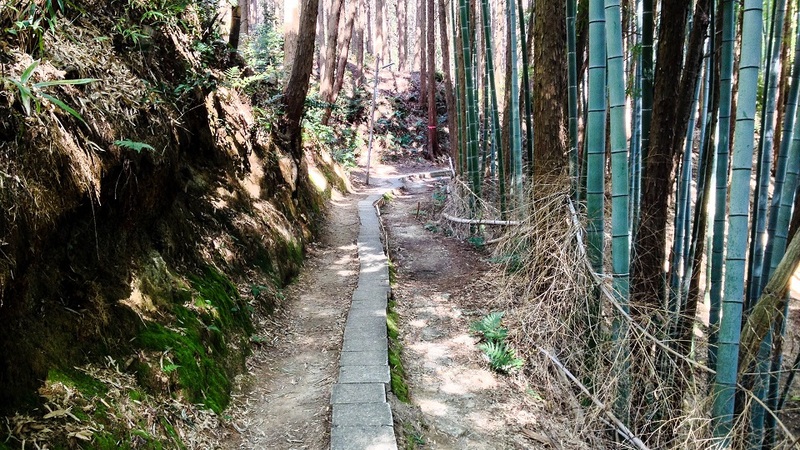 Is there really a path that goes between a thick bamboo forest where they grow over a hundred feet tall? 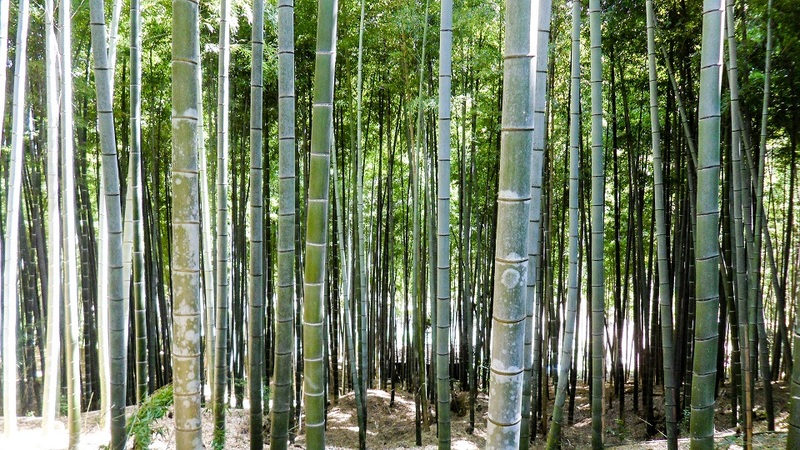 Well, as I said in the beginning, yes, and it is most certainly right here in Kyoto in the Arashiyama district! This is also where I discovered what is probably my favorite flavor of ice cream which you can check out in my Japan food article which should be completed soon! 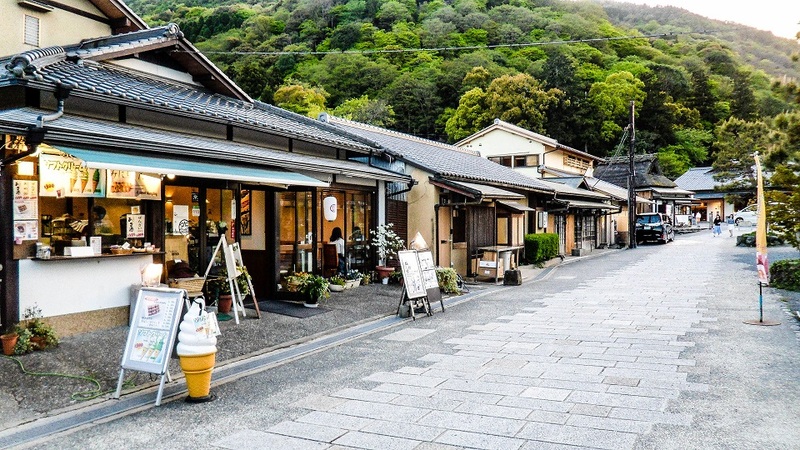 Even though I arrived here pretty early, I ended up spending the entire day here, there is so much to see and do in the Arashiyama district, it’s best to set aside a minimum of one entire day to explore it. 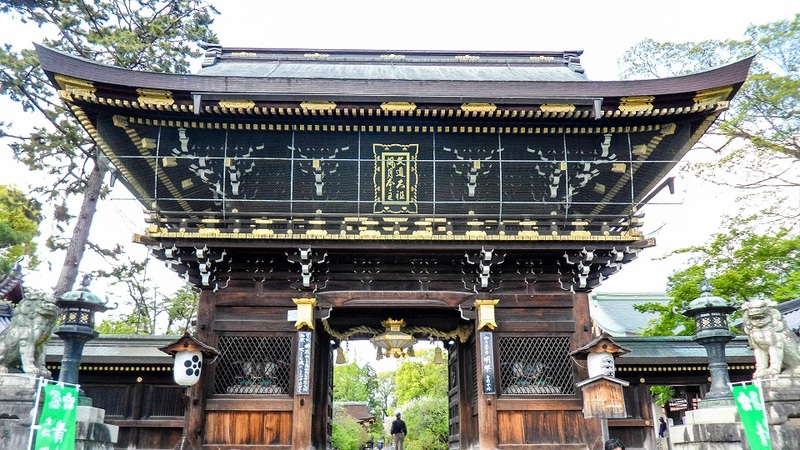 After enjoying some ice cream I made my way across the street from the ice cream parlour to the Tenryu-ji Temple. Now, I know what you’re thinking “What do the actual neighborhoods look like”? While I often show pictures of cities, food, and architecture, I often forget to focus a bit on how the actual people live. So, what do the actual normal streets and houses look like here? 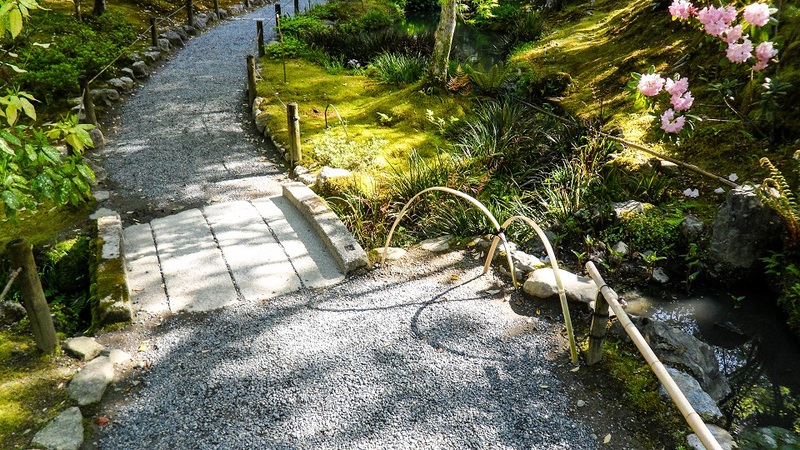 After looking at some alluring views of the Teryu-ji Temple grounds and the local neighborhood, let’s take a look at the famous Sagano Bamboo Forest! 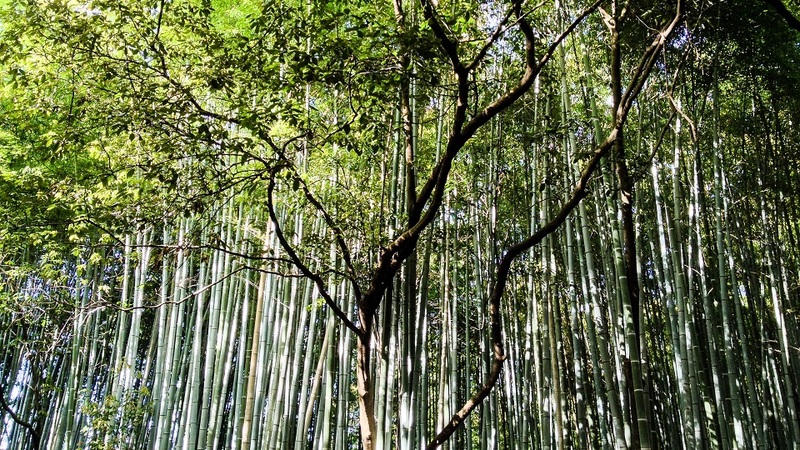 Now, the view itself is amazing, but did you know the sound of the wind blowing through the bamboo is graceful enough to be recognized officially as one of the “one hundred must-be-preserved sounds of Japan” by the Japanese government? Visiting this bamboo forest has been a very long-time dream of mine, so being able to walk through here was very satisfying and fulfilling. I must recommend coming early in the morning though as the crowd builds up quickly. 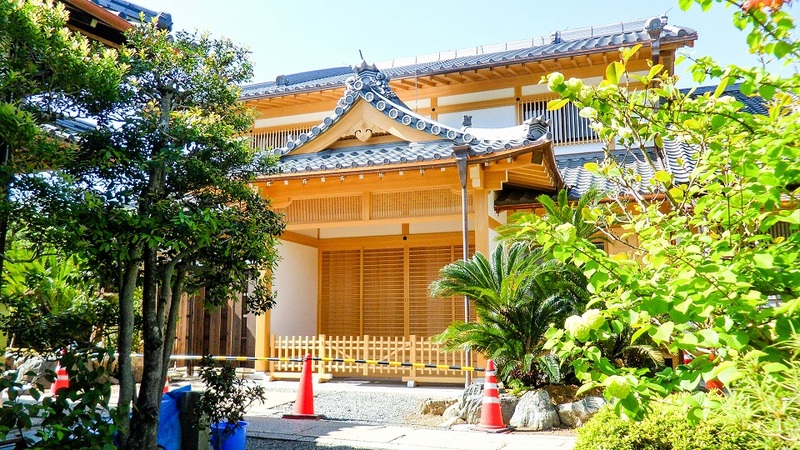 You can also rent a bicycle and ride through as well and continue on along a bike trail that loops around this area of Kyoto covering a good section of the Arashiyama district. You’ll eventually come to a T in the pathway, I ended up going to the right at first which led to the neighborhood, I walked around for a bit before going back and heading the other way. Going to the left leads to a very nice park and venturing further down hill leads to a river. This area is very unique, the river breaks off a chunk of flat land with mountains behind, it creates a very small area which is full of restaurants and a couple very exquisite hotels which I’m sure are pretty highly priced. 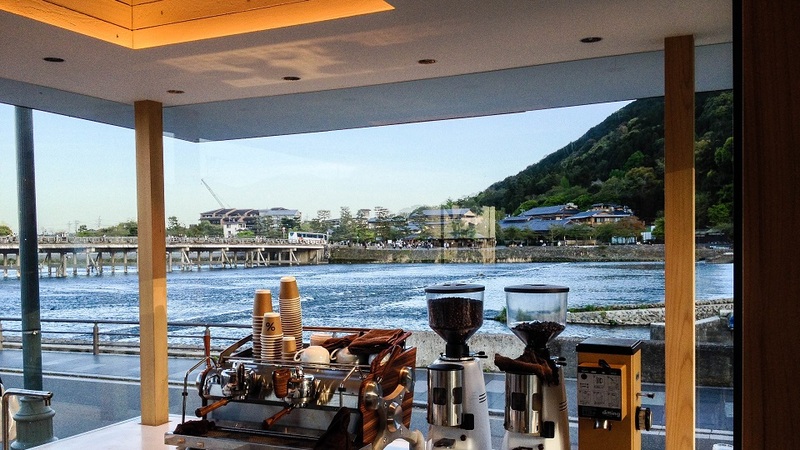 I spent a good amount of time here, but not before getting some coffee at a place that overlooks the river with a backdrop of a small mountain. 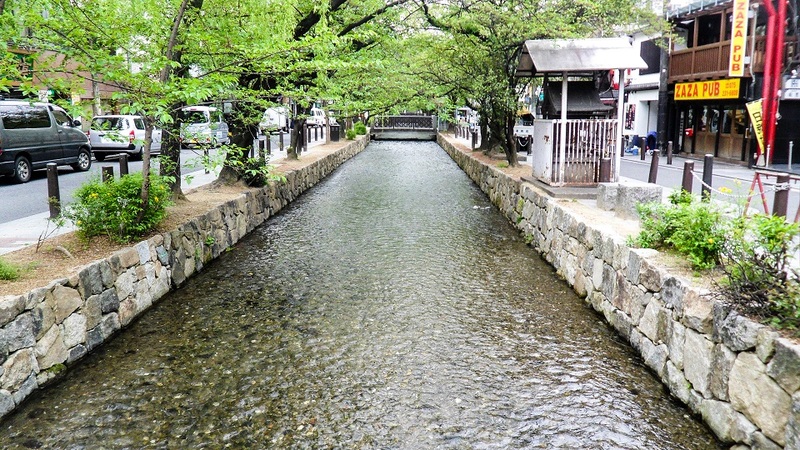 The river itself isn’t much to look at (compared to every other river in Kyoto I saw), but combining it into the overall experience and it adds a very nice touch. There were also several places right on the shores of the river, though almost all were closed by the time I made it to this area. This was one of the locations I wanted to return to, but as I said in my Tokyo post, there is a lot to do in Japan; visiting a place twice seems like a bad idea because you’ll be missing out on something else, so I decided against a second visit to this spot on this trip. The first 2 shots are before crossing over, the last one right above is after crossing over the river. It’s a small area, but certainly worth checking out. I had an excellent blue beverage here that had a hefty helping of ice cream thrown in with it; this is again something that will be featured in my future food post. At this point it was starting to get dark, so I made my way back to the rail station, however, on the way back I stopped by the Arashiyama rail station (throughout Japan you’ll learn there are several different train/subway/metro companies), some are local, some cover a large area, and then there are the long distance ones. This was one of the more local ones I stopped at. At this point I started to learn that it wasn’t just Tokyo that had very safe public transportation, it appeared true here in Kyoto and this stayed true in Osaka as well. After you’re here for a little while, one of the reasons crime is so low becomes obvious, the cities of Japan (atleast everywhere I went) all seemed to be well lit at any time of night and have some sort of security in place, sure there are some dark alleys, but oddly enough they never ever seemed threatening to me. And there are always people up at some hour transporting to or from a location, mainly business men that seem to love working intolerable hours, but like I said in my Tokyo post the work ethic here in Japan is extreme. There is one crime that I’ve heard does occur often though; inappropriate touching, usually on crowded trains/subways. In fact, it got bad enough at one point where they introduced “Women Only” train cars. 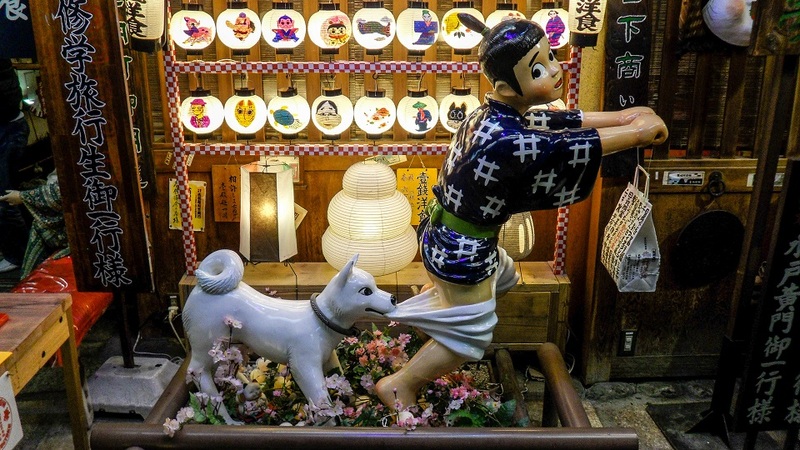 You’ll even find signs periodically that say things like “Watch for upskirting” which depicts someone with a sneaky selfie-stick trying to take a picture up a womans skirt, there was actually a Japanese movie that focused a bit on this called Love Exposure. However, it seems as though it has toned down a bit because I found myself accidently on a women only car several times, nothing was said to me, I didn’t get any evil looks, and occasionally I wasn’t the only guy either (I first thought it was because I was American and they figured I didn’t know any better, but since some Japanese men were on as well I assumed it wasn’t that). The cars do have a sign on them stating “Women Only”, but when the platforms are packed and people are rushing to get on before the doors close, you may not notice them the first time. And often I walked around so much I would basically be limping to a seat at the end of a day. If I was mistaken about it being toned down a bit, please let me know. The station also offered illuminated pillars that made a small maze and eventually led to a dragon ball. Not like the anime, but an actual big marble ball with a dragon etched into it sitting in a pond. I eventually made my way back to the nearby JR station and found myself back in my rental apartment. I’ve mentioned before about how I love just walking around until I find something interesting and then checking it out, derailing from the main path that most tourists follow. 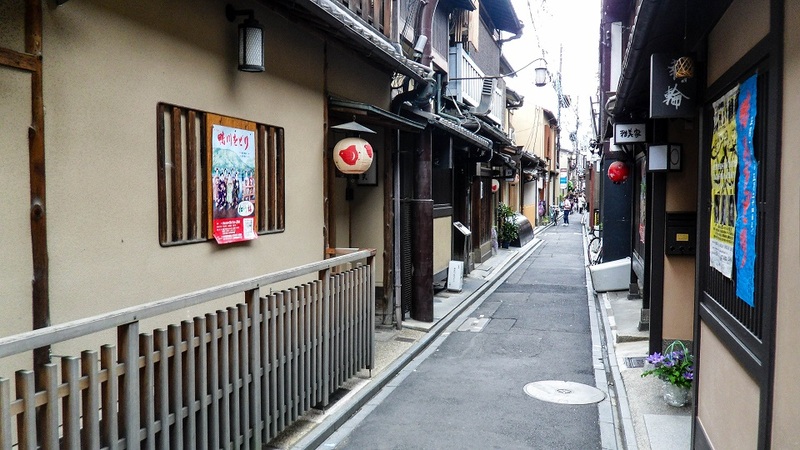 I arrived by train at Gijo station and started wandering around, I had an area in mind that I wanted to check out, but I knew I would spend a lot of time at this certain spot and planned on eating dinner there, so instead I started my journey of this part of Kyoto by going in the opposite direction in search of…. whatever I could find. 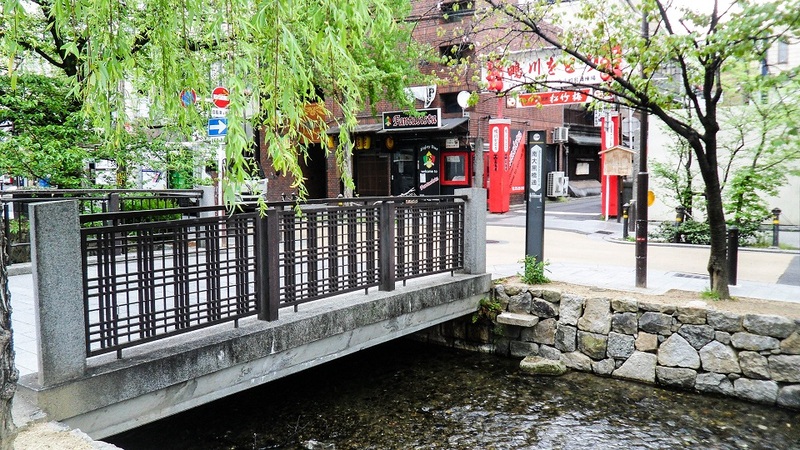 One of the main streets I used as a navigation point, the street itself is divided down the middle by this man-made river. Bridge leading across and over to a side street. One thing I never saw was a bridge in need of repair, they all seem extremely well maintained. This is the alley that changed my entire trip. 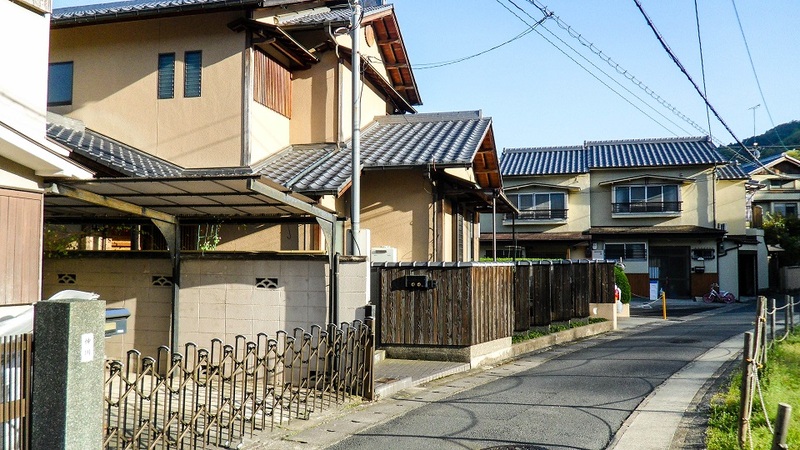 I had finally found what I started reffering to as “the Kyoto I was looking for”. I found this alley down one of the side streets and my perspective of the entire trip had just changed. I finally found the view I had been picturing in my head for the past couple decades! 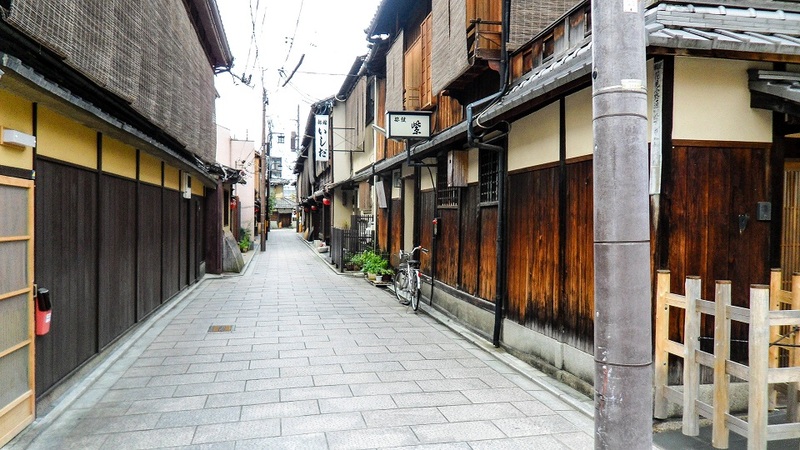 I now knew that the old-world style Japan still existed and that it really was here in Kyoto! Now, I just needed to find the entire neighborhood that I heard was still entirely stylized like this! However, I still had some wandering around to do, so after staying here for a moment and feeling a wave of relief and gratification, I continued on and started to search for something to drink. After walking around for about another 20 minutes (I always try to take my time when deciding on coffee or food) I came across a rather large building that apparently had a coffee shop in it called Traveling Coffee, I couldn’t resist checking it out, I was traveling after all and I love coffee so it seemed like a perfect fit…. until I found out what the building was. My jaw dropped and I went into complete shock! I love traveling, this should be obvious, but right behind traveling is movies. I absolutely love watching movies, if I’m not traveling or exploring, I’m probably watching a movie! So to find out that this very building was the birthplace of the Japanese motion picture industry was a find that I never would’ve expected. I was PUMPED! I’m sure I probably creeped a couple people out as the smile on my face was so wide it hurt! I’m also a huge fan of foreign films which most certainly includes Japanese at the top of that list! So after reading the plaque outside I ventured in! This however is where the title of this specific section came in to play. The building itself is actually an old school, possibly the oldest school I’ve ever seen. 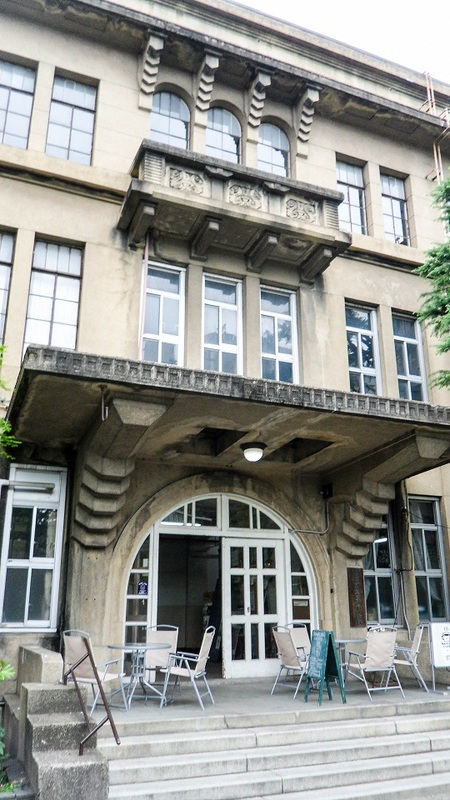 The film industry started here in 1897, so the school itself was already being used at that point, it was Rissei Elementary School, but is now used to show films as a historical place and of course the coffee shop! My mood changed though when I entered. This place made me very very uneasy, walking down the first hallway the floor squeeked and moaned extremely loud and it echoed down the halls. Some classrooms still had desks in them and everything became eerily silent the moment I stopped walking. I stopped at one point to look at something and was startled by someone who was standing behind me…. except no one was there. I pratically screamed, I completely freaked out and my heart started racing. I had never experienced something like this before, I had truly felt someone standing behind me. I started walking forward not thinking of the exit, just simply getting away from that spot. I came to one spot where I turned and almost panicked again when I saw my own reflection in a mirror against a wall. I didn’t leave because I really love movies… Yea, kinda silly and it sounds like something out of a horror movie where someone makes a dumb decision, but I didn’t let myself get chased out by fear. So I started taking pictures. There was one hall that had pictures of students from the past, I wanted to post them here, but I honestly don’t want to bring about any negative vibes, if you saw the pictures you would understand, one picture I took came out fine except none of the faces showed up in my picture…… yea, it was REALLY eerie. I also feel like it might be a bit disrespectful to post the pictures. Either way, I’ll tell you that some of the pictures only made things worse, this was a really spooky place. I did however go and have a coffee, and in the room where the coffee was being served also housed one of the very first cameras that existed in Japan, so yes, putting up with the creepiness was certainly worth it! I had wandered around for awhile and eventually grabbed lunch at a sushi place called Chojiro. This is where I ended up eating a baby squid, but more about that will be in my food article. Afterwards I started heading towards my original destination which was a wide street with countless stores and restaurants lining the sidewalks. While exploring this area I came across the neighborhood of my dreams. 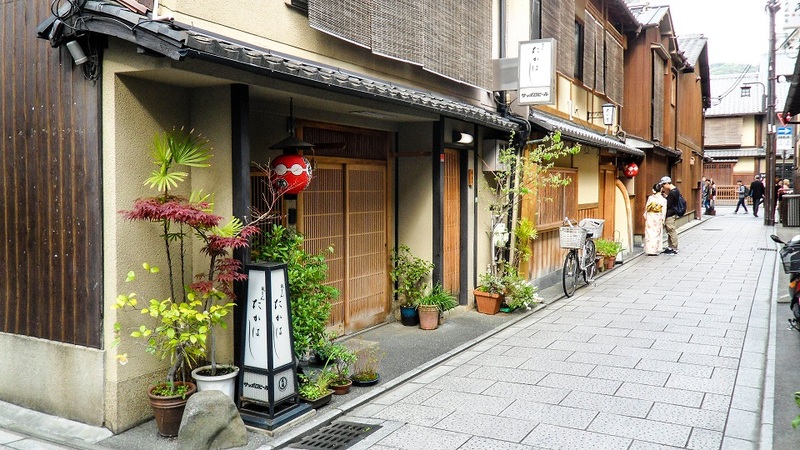 The Gion district, often referred to as the geisha district is what I considered to be the ultimate experience in Kyoto. 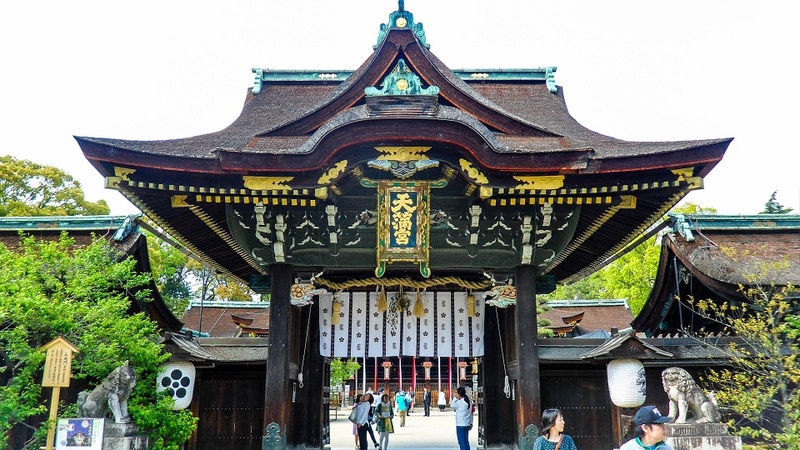 This is where you get to still experience old world Japan even today, the feeling of being sent back in time occurs right here! Once I arrived, I stayed until very late into the night, I did not want to leave! I stayed until the streets were empty! I explored this area inside and out, walking down many of the same streets 10 times over, just to make sure it sunk into my memories and to make sure I was really here, it really was a dream-come-true. 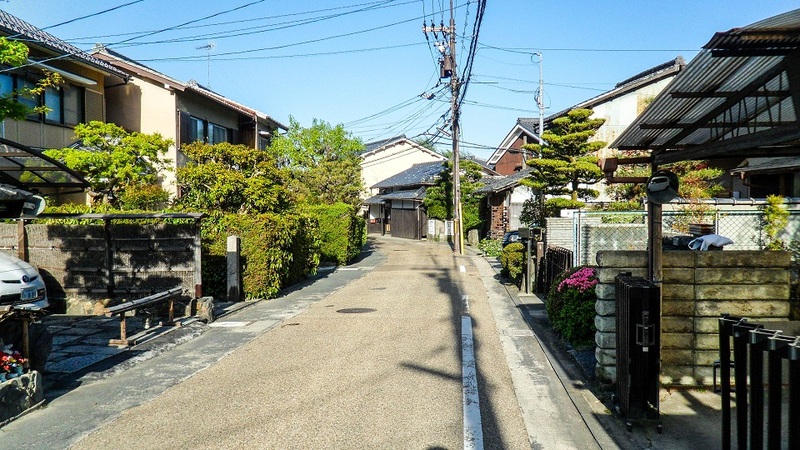 And even though Japan is extremely clean, I didn’t think it could get any cleaner, but as you can see in the picture above, after an entire day the street is absolutely spotless! Seriously, HOW DO THEY KEEP IT SO FRIGGIN’ CLEAN!? This is one of my favorite shots I think I’ve ever taken! There’s not much to say about this area, it’s a place you just need to see with your own eyes and experience in person. There is one slight downside though, if you want to eat here, it will cost you for the experience! The cheapest place I found for one meal was about $35 and it wasn’t going to be enough fill me up, most places started at about $50 and went up, some places didn’t even start until almost $100 per meal! So the one time I did eat, I drifted out of the area only 1 block away and went to coffee shop and got food there, nothing special or unique to write about, it was just something close by and significantly cheaper. If you hang around the area between about 5:00 to 7:00 you’ll see many geisha’s suddenly start appearing, wearing the white makeup and everything. I felt bad for them, as many of the other tourists/travelers suddenly turned into paparazzi, continuos camera flashes and people yelling constantly trying to get the geisha’s to turn towards them for a photo. The geisha’s had to put their heads down and move quickly towards their destination to get away from everybody. 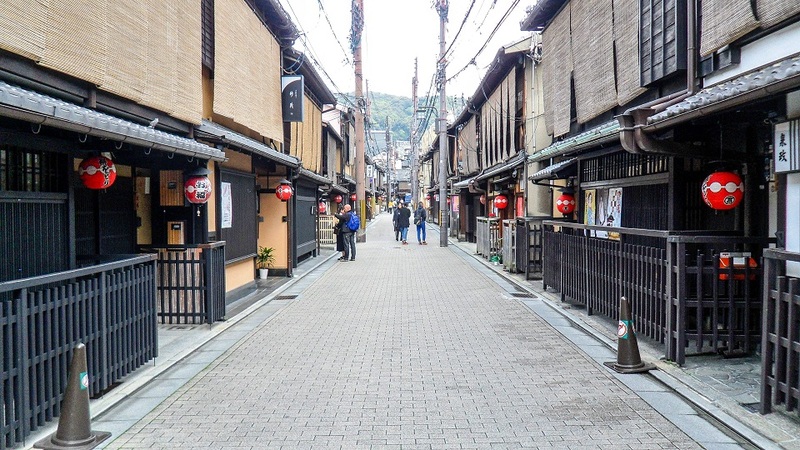 I could go on and on about Kyoto, but I need to end it here before this article gets any larger. I will leave you with only a few more pictures showing various different temples around Kyoto and something that gave me a good laugh. I highly recommend a visit here if you want an experience that is truly unlike any other. Thanks for reading my longest article yet! And be sure to check back soon for my articles on Osaka and my journey of food throughout Japan! 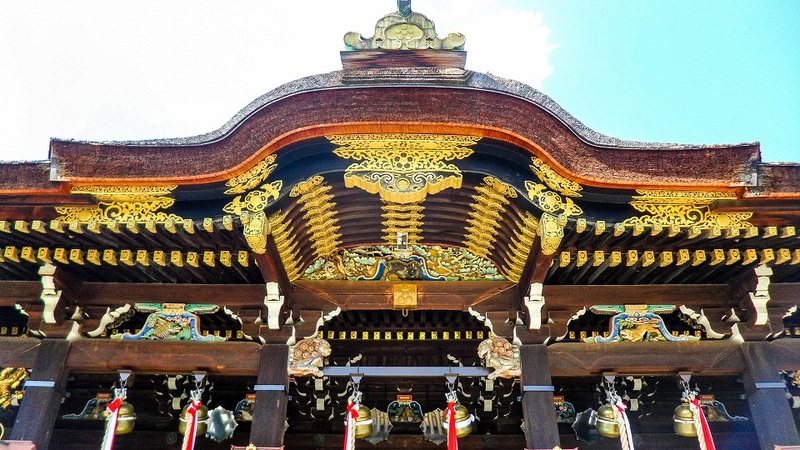 Next → Next post: Why Should You Bother Visiting Osaka? Excellent article and very interesting, especially about the elementary school. Love the ending too!!! Great article all the way around. No pictures of the Geishas?!?! They move pretty fast and there are a ton of other people trying to snap a shot. Something I need to try to do on my return visit!